High Style. Low Price. These Casual-Chic Tall Boots Are A Winter Must-Have! - Susan Said... WHAT?! Winter seems endless to me around this time of year. The skies are gray. The temps are frigid. And, I’ve been wearing the same winter outfits since October. What I need is some retail therapy! Unfortunately, my budget is slim after the holidays. So, this year I am updating my mid-winter wardrobe with just a few, key pieces. These up-to-the-minute essentials instantly elevate the pieces I already own. 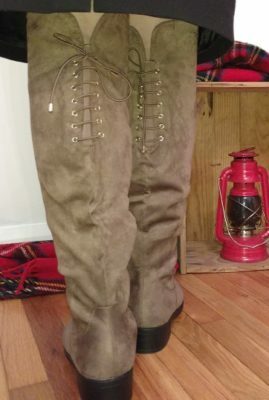 And, one of my favorite additions is a pair of stylish tall boots from LustHave. I personally love these tall boots with either leggings or skinny jeans. But, I was surprised to find that they also work wonderfully with a casual sweater dress and tights. But best of all, they are really comfortable. Many of my favorite boots have a high, stacked heel, which is a great look (when I don’t have to walk too much). But, the low heel and cushioned lining of these boots ensures that I won’t be limping by 5 pm. These 100% vegan suede tall boots are also incredibly affordable. They range in price from $29.99 – $35.99, depending on size and color selection. To see the different color variations in this style, click here. And, to see even more great boots, booties, slingbacks, heels and mules, visit LustHave. DISCLAIMER: No financial compensation was received in exchange for this tall boots post. I did, however, receive a product sample in order to provide an honest review. Regardless, I only recommend products or services that I believe will be good for my readers. Finding your favorite designer brands... made easy! Full grain leather wallet by Amelleon... just $13.89!